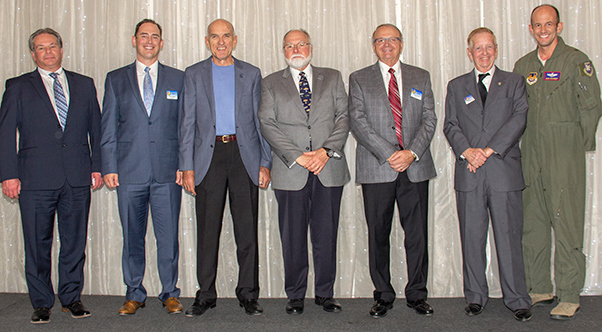 Bill McCabe, David Norris Chris Spicher, Les Uhazy, George Nagy and Bob Slade were sworn in by Brig Gen E. John “Dragon” Teichert, as Incoming Class of 2021 Directors during the Annual Installation of Officers and Directors at the Edwards AFB Civilian-Military banquet. In fact, Smith told the crowd of 100 gathered in the University of Antelope Valley Grand Ballroom that Edwards Air Force Base has “one of the best relations with the community” he’s ever seen. Smith acknowledged the presence of certain high-profile community members attending the dinner, including Lisa Moulton, district director for Congressman Steve Knight, R-Calif.; Donna Dennis-Hill, field representative for State Sen. Scott Wilk, R-Santa Clarita; Russell Williams, field representative for Assemblyman Tom Lackey, R-Palmdale; Donna Termeer, field deputy for Los Angeles County 5th District Supervisor Kathryn Barger; Kern County 2nd District Supervisor Zack Scrivner and his wife Christina; Dr. Les Uhazy, dean at Antelope Valley College, accompanied by his wife Jane; Alis Odenthal, retired manager at Southern California Edison; and Aida O’Connor, founder of the Civ-Mil Support Group. Allen Hoffman, a Boeing site manager at Edwards/NASA Armstrong and president of the Civ-Mil Support Group announced the presentation of colors by the Blue Eagles Honor Guard. “I love the whole U.S. Air Force and the Navy,” Hoffman said. Brig. Gen. E. John “Dragon” Teichert, commander of the 412 Test Wing, administered the oath to incoming officers and directors on the Civ-Mil board. Officers are Hoffman as president; Rhonda J. Nelson as vice president; Matthew Winheim as secretary; and David Norris as treasurer. 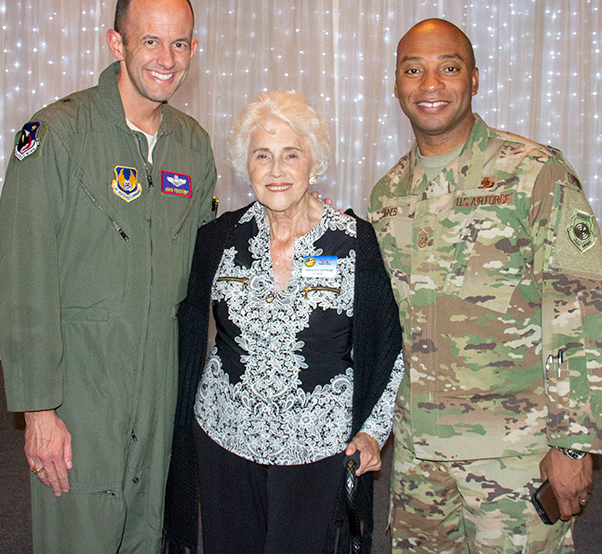 Gen E. John “Dragon” Teichert Commander, 412 Test Wing, Aida O’Connor and Chief Master Sgt. Roosevelt Jones enjoy the Civ-Mil Annual Installation of Officers and Directors banquet. O’ Connor started the organization more than 25 years ago to help support those serving at Edwards AFB. Civ-Mil supports the enlisted with practical needs such as emergency travel, supports Airman’s Attic where families can shop for free, and entertainment such as pool tables and computers, to help make life a little more enjoyable at Edwards. Jones is the principle adviser to the commander on matters concerning morale, welfare, discipline, training, fitness and quality force initiatives and effective utilization of the wing’s personnel and their families. Incoming directors included George Nagy, who retained his board seat, as did Nelson, Norris and Winheim. Others who remained on the Board of Directors included Les Uhazy and Bob Slade. Three new directors on the board were Chris Spicher, Bill McCabe and Alexia Svejda. Although Mark Thompson and Mike Belzil will no longer serve on the board, each man will maintain membership in the Civ-Mil Group. They were recognized for their great contributions of time and energy over the years. Teichert told the crowd that on May 2, 1776, France and Spain each donated $1 million of weapons and ammunition to the American Revolutionary Cause. Eight days later, the Second Continental Congress approved that the Colonies could form independent governments. Two months later, the Declaration of Independence was signed. Hoffman mentioned some of Civ-Mil’s accomplishments. He reviewed past efforts with eyes set on the future. Some of the money went to an Emergency Relief Fund. Other dollars went to holiday projects for those serving overseas and their families back home. The Support Group ordered new flags for the Flag Park. Support Group members also worked on Quality of Life initiatives and they refurbished a pool table for the Airman Leadership School. 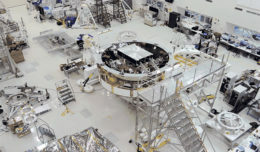 Group members distributed books recognizing the organization’s 25th Anniversary to every Air Force Base, all regional libraries, school districts and other interested parties here in Aerospace Valley, Hoffman said. 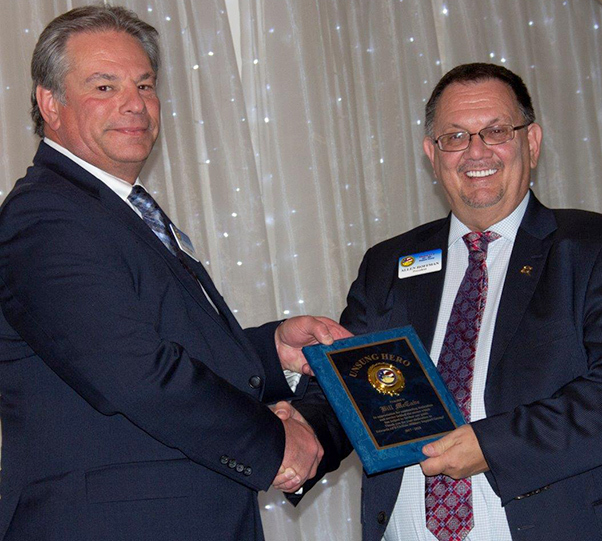 Bill McCabe received the “Unsung Hero Award” by Civ-Mil President, Al Hoffman, at Civ-Mil’s Annual Installation of Officers and Directors. Hoffman invited McCabe to come to a meeting. McCabe obliged, liking what he heard about the group, he became more involved. McCabe said he felt blessed and it makes him feel happy to help and give back to those serving. On May 18 the Group had Civ-Mil Outreach Day at Edwards. “You got to see more than the hardware. You got to see how the people live,” Hoffman said. Military Retirees Appreciation Day followed on May 19. An Inaugural Golf Tournament took place Sept. 28 at Muroc Lake Golf Course. “I’m not really a golfer, but I learned a lot about golfing,” Hoffman said, adding he foresees the tournament becoming an annual event. He lamented about the death of veteran George “Bud” Reams in September. Reams had been the Group’s treasurer and long-time director. “Bud meticulously kept our financial records current.” Hoffman said Group member David Norris “stepped up” to fill the treasurer’s role. Reams was voted an honorary lifetime member. Another very visible veteran, Gunnery Sgt. R. Lee Ermey, died earlier this year. Those who knew him called him “Gunny.” As a remembrance, the road at Avenue N and Sierra Highway will be dedicated in his name at 11:20 a.m. on Nov. 10 – a spot where some locals gather to watch aircraft at Plant 42 soar.